The world of hair transplants and restoration is filled with methods and terminology such as grafts, strip harvesting and follicular unit extraction. These techniques and procedures have been in use for many years and are among the most commonly employed methods of helping patients suffering from hair loss. While Dr. Parsa Mohebi, M.D. has utilized many of these methods over the years, he also keeps an eye on the future by spotlighting a few of the unconventional and experimental methods currently being researched and implemented across the country. One of the methods featured on the website of Parsa Mohebi, the founder of Parsa Mohebi Hair Restoration, is the use of PRP for hair growth. Platelet Rich Plasma (PRP) comes from the blood of a patient and it contains both platelets and growth factors. As PRP growth factors have been shown to aid in organ and tissue healing, it is thought that PRP might also aid in hair growth. Studies have been performed on patients but Dr. Mohebi says the results have (so far) been inconsistent. Another unconventional method mentioned by Dr. Mohebi is hair cloning. Simply put, hair cloning is the production of multiple hair follicles form the follicle of a single hair. Hair cloning can be performed In Vivo (inside the skin) or In Vitro (hair follicles are created outside the body). As of now, there is no widespread method of hair cloning currently in use. The final experimental method Dr. Mohebi spotlights is gene therapy for hair loss treatment. Multiple therapies that aid with wound repair suggest a connection exists between hair growth and wound healing. Initial results are promising but Dr. Mohebi says more research needs to be done before gene therapy achieves widespread use on human patients. 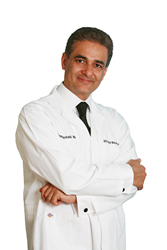 According to Dr. Mohebi, it is important to look to the future of hair transplantation. Dr. Mohebi goes on to say that “the field of hair transplantation is constantly growing. New techniques and treatments are being researched as well as implemented by doctors on a regular basis. Some of the new techniques are based firmly in the world of science and are researched and tested. Other techniques are not as grounded in the world of traditional scientific methods. The lack of concrete results means these experimental methods have not reached the point of being widely accepted. Dr. Mohebi has started a page on his website to help those interested in the field of hair transplantation stay up to date on the above experimental methods as well as any additional methods created in the future. While the field of hair transplants has evolved greatly over the years, Dr. Mohebi says there is still much to be learned and implemented in order to help patients achieve the best results possible.